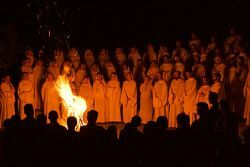 Since the first centuries of Christianity there have been men and women who early on came to be called monastics, and who gave up everything in an attempt to live in radical obedience to the Gospel, in celibacy and in community. Bose lies within this tradition, which belongs to the Christian East and West alike. 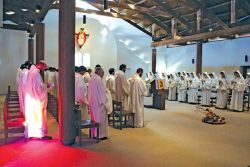 The community seeks to live monastic life in our own time under the guidance of a rule and a spiritual father, the prior, whose duty it is to point the community at all times towards the one true light of the Gospel of Jesus Christ. "Bose" is a monastic community of men and women belonging to different Christian churches. It is a monastic community seeking God in prayer, poverty, celibacy, and obedience to the Gospel. It is a monastic community living in fellowship with men and women and at their service. 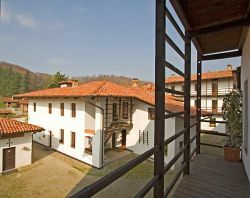 The Monastic Community of Bose was canonically approved by a decree dated 11 July 2000 of the Bishop of Biella, Massimo Giustetti, who also approved its statute and the monastic rule that went with it. The present Ordinary, Bishop Gabriele Mana, confirmed the above status of juridical person and approved modifications to the statute in a decree dated 29 June 2010. The monastic rule was approved by Cardinal Michele Pellegrino of Turin on the occasion of the profession of the first seven brothers, 23 April 1973, and was confirmed by his successor, Cardinal Anastasio Ballestrero on 6 August 1978. The community came into being on the 8th of December, 1965. On that day the Second Vatican Council concluded its work, and Enzo Bianchi decided to live alone in a rented house near the dairy farms at Bose. Three years later the first brothers, a sister, and a Reformed pastor joined him. Since then, in the morning, at noon and in the evening, the liturgy of the hours has been sung, hospitality has been offered, the Scriptures and the monastic tradition have been studied, and the demanding yet enriching adventure of life in community has been pursued. The common prayer of the community in three daily offices is complemented in the life of each brother and sister by personal prayer, and especially by lectio divina, which a member of the community leads each day for guests as well. On Saturday evenings the community and its guests meet for the community vigil in preparation for the Sunday Eucharist. They listen to the Sunday biblical readings, and the prior, or a brother appointed by him, helps the community to perceive the spiritual unity in the passages of Scripture indicated by the lectionary. What is the life of the brothers and sisters of Bose like? It is a simple way of life, focused on what is essential: a cenobitic life of prayer and work. A monastic community has only one specific task, that of believing and living in the one God has sent, Jesus Christ. All the members of community work, earning their living with their own hands, just like everyone else, and following the example of the apostles and fathers. Cultivation of fields and gardens, ceramics, icon painting, carpentry, publishing, printing, and study of the Bible and the Judeo-Christian tradition are the professional activities in which members have so far engaged. Through their work they serve both the community and the local churches, which often feel the need to walk for a while with the community on its way, seeking together with the community a deeper understandig of biblical and spiritual issues. Our community receives no financial assistance and lives entirely on what its members earn. It wishes, however, to remain a place where all are welcome. There are no fixed charges for hospitality, but it is left to the discretion of visitors to contribute freely according to their means. Our work and your generosity enable us to welcome guests with limited means. Hospitality has been practised since monasticism began. 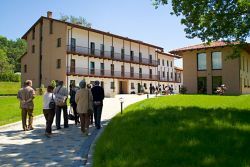 At Bose all are welcome, and especially those who want to experience community life, as well as those who need a place of retreat where they can spend time in silence. Our community welcomes everyone, but particularly those who would like to share in our prayer and our life, or would like to talk with some of the brothers and sisters about the problems of the world and the church.